Central air conditioning allow you to keep the large units and the noise they make outside while providing consistent cooling across your entire home. If you're looking to make your home more comfortable during the hot summer months, central air conditioning is the ideal option. While there are a few variations of central AC systems, all allow you to keep your entire home at a cool, comfortable temperature. Modern central air units also provide excellent efficiency, helping you save money on your utility costs. Dr. Energy Saver specializes in central air conditioning installation, repair, and maintenance, and we can help you get the right unit for your home. If you're interested in upgrading to central air, contact your local Dr. Energy Saver dealer today to get started with an estimate! A common practice when installing central air conditioning is to place the evaporator coil above the furnace's existing blower and to use existing air ducts to distribute cooled air throughout your house. A central air conditioning (AC) system relies on a refrigerant compound to "pump" heat from one location to another, thus providing cooling. In the evaporator coil of an AC system, the refrigerant compound is allowed to expand and change from a liquid into a vapor, which causes it to give up a great deal of heat. A blower in your AC system's air handler forces warm interior air through an evaporator coil, cooling the air before it enters the ducts that distribute the air throughout the house. 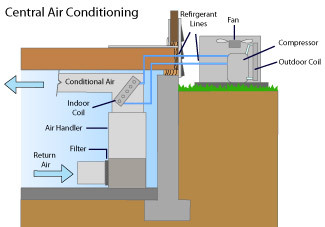 Along with cooling, the AC system provides dehumidification, removing some of the moisture from indoor air. 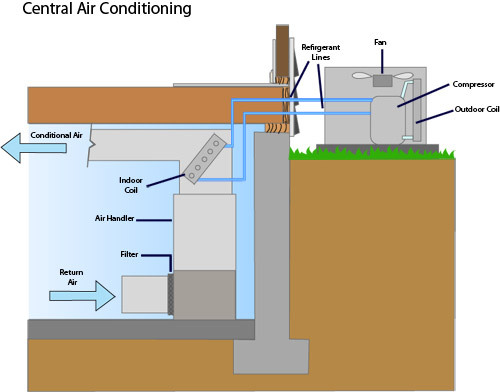 The two main types of central air systems are packaged systems and split systems. Your Dr. Energy Saver Dealer will help you determine the best system for your home based on your needs and your home's existing ductwork. If you have an outdated central AC unit or are using window units, replacing your system with an ENERGY STAR® qualified model could cut your cooling costs by as much as 30%. Of course, no matter how new or how efficient your central AC system is, you can't expect optimum efficiency if your ductwork system is faulty. As much as 20% of the air your system supplies can escape through leaks in your ductwork. Sealing these leaks and insulating certain sections of your ductwork are affordable upgrades that will enable you to enjoy greater comfort and lower utility bills. 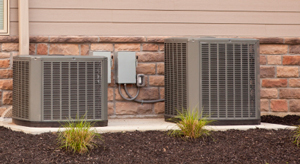 Additionally, some central AC systems are actually heat pumps that provide cooling as well as heating. When hot weather ends and the heating season begins, a dual-mode heat pump can reverse the refrigerant cycle and begin to warm the air that is blown through your ductwork system. Air-source heat pump systems that supply heating and cooling work best in climates with mild winters. To work efficiently in a cold climate, a ground-source (aka geothermal) heat pump may be a better choice. If you're interested in upgrading to this efficient system, ask your Dr. Energy Saver dealer what option works best for your home. If you're interested in upgrading your home's cooling system to central air, or if you need repair or maintenance on your current central AC system, Dr. Energy Saver can help! We provide complete central air conditioning installation and repair services, and we'll help you get the right unit to keep your home comfortable and efficient. Contact your local Dr. Energy Saver dealer today to get your estimate!